The Small Hall is on the ground floor. 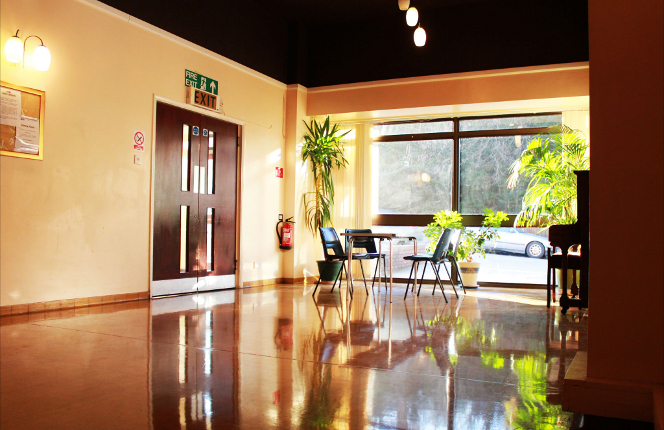 Regular clients who hire the Small Hall use it for drama and fitness classes, as well as meetings and training. Approximately 4 metre x 8 metre hall size. Capacity for 40 people (maximum). Direct access to large kitchen via door and serving hatch. Access to Large Hall via set of double doors. Ground floor with ramp for wheel-chair access. Chairs and tables. Rectangular tables seat six people (four feet long) or eight people (six feet long). These are included in the hire charge. Use of an acoustic upright wheeled piano. All necessary fire safety equipment is installed, along with a fully serviced fire alarm.